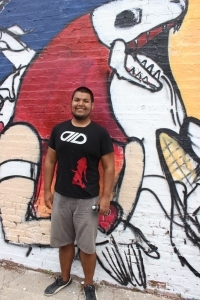 Self-taught artist Josue Aldana is changing the corridors of Little Village one mural at a time with odes to his Mexican roots. “There is nothing that gives me greater joy or gets more enthusiastic than creating art around the Little Village neighborhood, my community,” said Aldana. 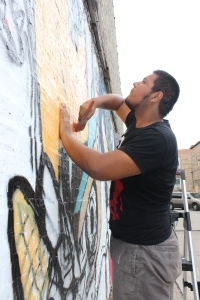 Aldana, a freelance muralist in the South Lawndale area, began his career by collaborating with Enlace Chicago, The Chicago Public Art Group and Ceasefire. During his informative years, Aldana spent some time living in Mexico where he became captivated by the local street artists, which helped him to develop his unique style through community mural collaborations. Aldana has partnered with many muralists and is recognized as Chicago’s street artists, starting with an apprenticeship under Maria Gaspar and Rahman Statik. Aldana’s mural designs are filled with contemporary and baroque Latin American art, displaying depictions of Mexican history and folklore. Featured in the Chicago Tribune, Aldana has worked in recent years to address gang graffiti in the Little Village community. His latest project, which is spearheaded by Red Bull, can be seen on at 4049 W. 26th St, corner of Karlov, will lead into the Mexican Independence festivities and through its partnership with the Little Village Chamber of Commerce.